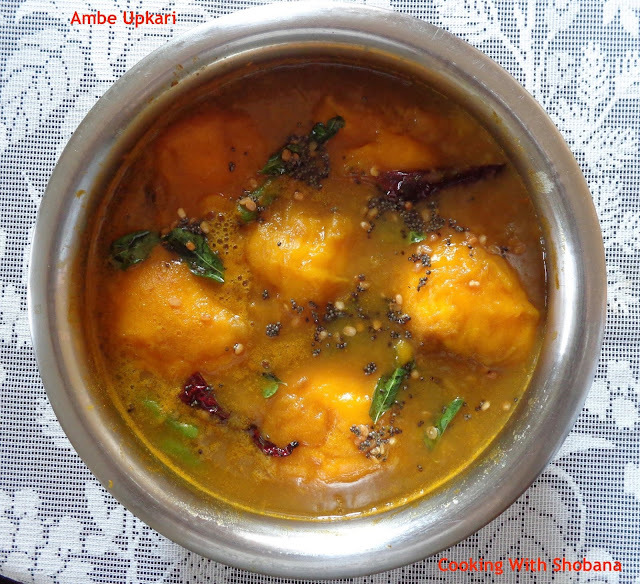 In Konkani, mangoes are called, "Ambo" so today's dish is of a sweet-tangy curry made with mangoes, called, "Ambe Upkari." In our hometown of Mangalore, this dish is typically made with small ripe mangoes which are not very sweet called "Gointo Ambos" available during the mango season. In case you don't have them, as they are usually not available in other places, you could use any other ripe mango which is not too sweet. Usually, we do not use the more sweet higher quality mangoes such as the Alpohonso etc for this dish settling for the more common varieties like Raspuri, for example. Ambe Upkari is served as a side dish with the main meal. The amount of jaggery you add will depend on the sweetness of the mangoes used. The maida or rice flour added is essential as it helps thicken the dish. Wash and peel the mangoes. Take away the mango peels and keep the peeled mangoes in a vessel. Place the mango peels in a bowl along with 1 cup of water and using your fingers extract the mango pulp from it. Add this extract to the peeled mangoes. Once again, add 1 cup of water to the mango peels and squeeze them to extract the remaining mango pulp.